Pockets of flames dot the cityscape as the night goes on. Smoke obscures the buildings and signals to those sheltered in the safety of their homes that the destruction rages on outside. An adolescent at the time, artist Sandy Rodriguez never thought she would later recreate these landscapes of the 1992 Los Angeles riots 23 years later. At just 16 years old, Rodriguez had already found her calling when she was recruited by the Los Angeles County High School for the Arts. “That was probably the moment when I said, ‘Oh wait, I can do this as my life’s work,’” Rodriguez said. Today, Rodriguez’s career is gaining traction as she is the first painter to participate in the Art + Practice Foundation’s (A+P) Artists-in-Residency program. During this 14-month residency, Rodriguez was provided the necessary art supplies and studio space in order for her to grow as an artist. Rodriguez is one of three artists whose work will be shown in the A+P Artists in Residence Exhibit from July 11 to August 29. Over the course of the last year, she has produced over 40 works, many featuring L.A. landscapes. A+P was established by artist Mark Bradford, social activist Allan DiCastro, and philanthropist Eileen Harris Norton. The foundation attempts to administer a sense of culture and community to the neighborhood by paying it forward through a combination of providing social services to foster youth and bringing exposure to contemporary art. Located in Leimert Park in downtown L.A., A+P is still in the process of fully establishing itself in its new surroundings. Working on completing construction on the EsoWon Bookstore to be included as part of A+P’s space, the inaugural artists-in-residency program was one of the first initiatives implemented. The artists featured in the exhibition include Rodriguez, Aalia Brown, and Dale Davis, whose projects all have been given a chance to bloom with the support of A+P. This has been Rodriguez’s most prolific year as she has gotten the chance to produce dozens of pieces and also be challenged on the direction they take as well. Working with curators and having conversations about her works throughout the last year has led Rodriguez to exploring new facets of the themes she often paints. “I think that artists that are given support, platform, exposure, space, and all of these resources, it absolutely pushes [them] to try things that [they] wouldn’t have tried,” Rodriguez said. While Rodriguez explores new frontiers in her artwork, she does so with her family’s roots laying the foundation of her work. As a third-generation painter, Rodriguez finds the presence of paint and an easel comforting. Growing up, the smell of “linseed oil and chicken soup,” was a familiar scent at her grandmother’s house who had a studio in her backyard. Now with a studio space of her own, Rodriguez balances her time between working as an educator at the J. Paul Getty Museum and helping emerging artists to further develop their skills. 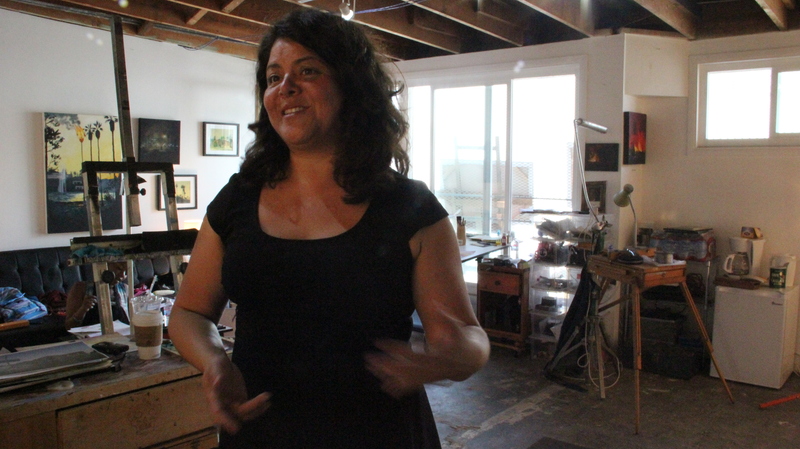 When visiting Rodriguez in her studio, you can see she has made the space her own. With pieces of various sizes dotting the walls, only the wooden beams of the low ceiling are left exposed. Music playing softly in the background is carried by the breeze of the open door as Rodriguez and her young artists chat and paint the day away. One of the young artists she mentors sits on the floor exasperated by where to start on her next piece. “Start with color,” are Rodriguez’s words of advice as she carries over a watercolor pallet. Rodriguez puts an emphasis on color in her own work as well. Rodriguez often starts many of her paintings by simply painting the background of the canvas in a solid color first. While her fog and tear gas series are often based on a black background with ethereal wisps of color rolling off of the surface, in her series of paintings that focuses on fire, she utilizes a cochineal (red) pigment originally made in Oaxaca City, Mexico. Using the red as the base color of the canvas, Rodriguez experiments with the versatility of fire as a force of nature. Painting fire in different settings, from the 1992 L.A. riots that she grew up seeing, to the flame-filled protests that stole the front page after 43 students went missing in Mexico City, Rodriguez looks at the way painted images can serve as agents for social change. Often painting photos she sees on the news, Rodriguez infuses emotion into the images she recreates as paintings, hoping to engage her viewers that are often lost in the bombardment of visual images that define today’s generation. “You seduce someone into a beautifully painted oil painting that has a lot of information on the surface but also in the detail, so that you pull someone in and create an opportunity for living people to engage and make meaning,” Rodriguez said. The value Rodriguez puts on engaging with not only her audience, but the next generation of artists is clear as she hosts walking watercolor workshops and meets weekly with a group of five young female artists. Becoming a mentor and friend to these up-and-coming artists, Rodriguez helps to jump start their own careers and include them in her own projects. Simply put: Brava, Brava, Brava! Thank you Karolynne! Hope to see you soon.